Agriculture in developing countries has attracted increasing attention in international negotiations within the United Nations Framework Convention on Climate Change for both adaptation to climate change and greenhouse gas mitigation. However, there is limited understanding about potential complementarity between management practices that promote adaptation and mitigation, and limited basis to account for greenhouse gas emission reductions in this sector. The good news is that the global research community could provide the support needed to address these issues through further research linking adaptation and mitigation. In addition, a small shift in strategy by the Intergovernmental Panel on Climate Change (IPCC) and ongoing assistance from agricultural organizations could produce a framework to move the research and development from concept to reality. In turn, significant progress is possible in the near term providing the basis for UNFCCC negotiations to move beyond discussion to action for the agricultural sector in developing countries. Ogle SM, Olander L, Wollenberg E, Rosenstock T, Tubiello F, Paustian K, Buendia L, Nihart A, Smith P. 2014. 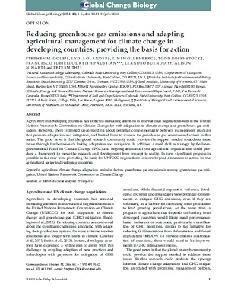 Reducing greenhouse gas emissions and adapting agricultural management for climate change in developing countries: providing the basis for action. Global Change Biology 20(1):1–6.